This cracks me up. 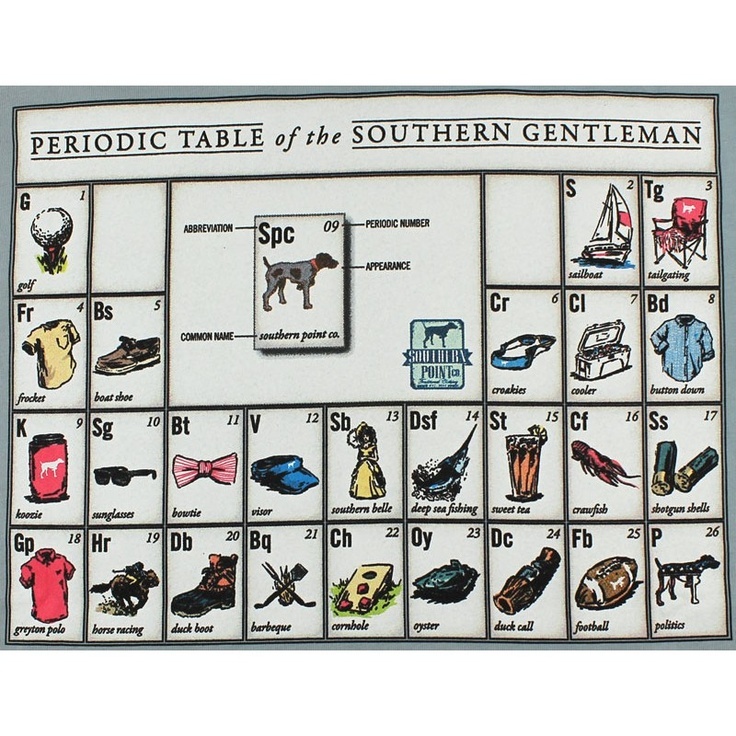 The Periodic Table for the Southern Gentleman. Golf, Boat Shoes, Koozies, Guns, Sweet Tea, Football, BBQ, Horse racing, Croakies, Deep Sea Fishing and so on. The best part is… these are all true. Between my four guy cousins that live down here, a number of southern guys I’ve dated and the number of male college students I’ve worked with over the years, I’ve seen these repeated- often. I’ve even eaten the fish that my cousins have caught deep sea fishing, while sipping a cold beverage from a koozie and talking football and politics. It’s hilarious, but this periodic table is dead on!